I first became interested in hiking the AT, while going through chemotherapy for Non Hodgkin’s Lymphoma, which I was diagnosed with in October of 2008. I came across Jean Deeds’ book, “There Are Mountains To Climb” in the share library at the infusion center. Jean was a 52 year old woman who aspired to hike the AT in her middle years, and did finally complete it after an injury threw her off trail for some time. I thought to myself, “I want to do that. If she can do it, I think I can, too”. Although I am currently in remission and hopefully shall continue to be so for a long time, it’s not one of the 30+ types of NHL that is actually curable. Time really is tick, tick, ticking … the time is now, as I just don’t know how many seasons I will be gifted with. I hope that in this transcribing of the journey, others with chronic illnesses realize that these limitations and challenges can be worked around, that illness doesn’t have to stop you from living out your dreams. I was not in the best of physical shape after nearly 2 years of treatments, and a 25 year smoker, so at age 54, I took up running – which has increased my leg strength and cardio capacity greatly. Believe me, I did not start out “running” miles and miles, rather, it’s been a slow incremental process, but I can honestly say I’m in the best shape of my life. 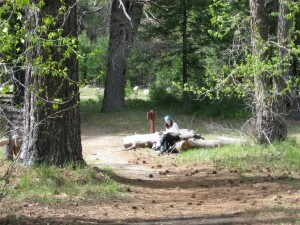 I had never even heard of the AT previously, although had been a car camper and day hiker in my native Oregon. I began reading everything I could get my hands on about hiking long distances, along with the books out there about the long distance trails. Perhaps the most challenging thing the Appalachian Trail will present is facing one of my worst phobia’s: thunderstorms. Oddly enough, my Great Great Grandparents came from the beginning area of the AT – NE Georgia and the area around Canton, NC and Hall County, Georgia. My Great Great Grandmother was Cherokee (and possibly part Catawba) and the Great Great Grandfather’s mother was Native, although I don’t know which tribe. I have one photo of her. They left Georgia and moved to Arkansas (She walked, unable to ride the horse because she was pregnant). One of their daughters (my Grandmother’s mother) married and migrated to Oregon. My Grandmother, unfortunately, was from the old school thinking “throw ’em in the pool to teach ’em to swim”, to get over fears. I’m middle aged now and still have a very distinct reaction when storms brew up…all systems are “go” and my body still goes into total flight or fight response. I now think that perhaps Grandma, who carried many of her Cherokee ancestral beliefs and practices, found magic in the Thunder, and could not understand my fear. It’s one of the most engaging lures for me – this reverence for Thunder, the draw to the place my family came from. The facing of my worst phobia.